Argentina's central bank boss has stepped down after the president signed a decree firing him for refusing to use currency reserves to pay foreign debt. 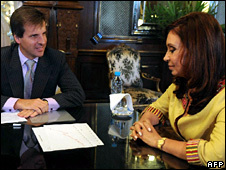 Cristina Fernandez de Kirchner cited misconduct and dereliction of duties in a decree dismissing Martin Redrado. A spokesman for Mr Redrado said he had agreed to step aside but not to resign, and was launching a legal challenge. Constitutional lawyers say the decree may be illegal, as the central bank chief can only be removed by Congress. Mr Redrado angered the president after he rejected her order to transfer $6.6bn to a government fund to pay foreign debts. Argentina has $13bn of international debt that matures this year, and a hole in its budget of between $2bn and $7bn. The BBC's Candace Piette, in Buenos Aires, says economic analysts believe the attempt to sack Mr Redrado shows how desperate Argentina's government is to get funds to pay debt - a bad sign for a country seeking more foreign investors. In the emergency decree, Mrs Fernandez de Kirchner said the central bank governor had "failed to fulfil the duties of a public servant" and urged prosecutors to seek unspecified "legal measures" against him. Later she named Mr Redrado's deputy, Miguel Pesce, as his interim successor. Mr Pesce had supported the government's move to use reserves to cover debt. "The decision was made because the central bank must keep functioning," she said. But opposition politicians and constitutional experts said the president did not have the legal authority to dismiss Mr Redrado. Under the bank's charter, the government can dismiss a member of its board, but must have a recommendation from a special congressional committee. Economy Minister Amado Boudou said since it was ultimately the president's decision and Congress was in recess, the direct dismissal was legal.